THE DEVASTATED owner of Applejacks café in West Belfast says she is ‘exhausted and devastated’ as her business has been targeted for the third time in a fortnight. 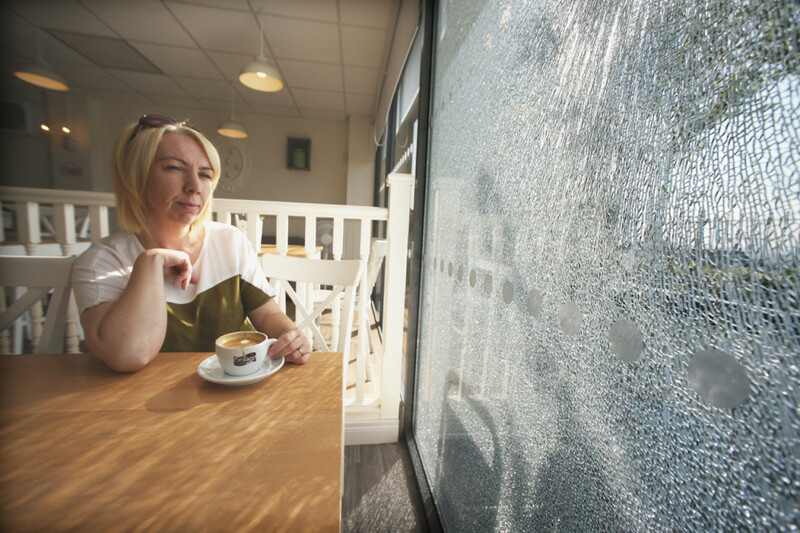 Some time between 6.30pm on Wednesday evening and 7am on Thursday morning one of the main windows at the Glen Road café was shattered. A tearful Jackie Bradley told Daily Belfast that she cannot understand why the attacks keep happening. She said: “We are a threat to no one, we aren’t hurting any other businesses in the area, we are just hard working people who are trying to get our business off the ground. On April 26 two men broke into the premises, destroying the shutters and making off with a sum of money which was left in the till and a few days prior to that their brand new signage was damaged. Jackie said: “After the two incidents last month the people of West Belfast couldn’t do enough for us, we love this community and we are staying here. “Our customers are fantastic, especially the wee school boys who are our bread and butter, they are lovely. You hear a lot of people running this community down but we think it’s brilliant. Jackie says that although this is the third attack in as many weeks she is remaining positive and hopes that it isn’t personal.